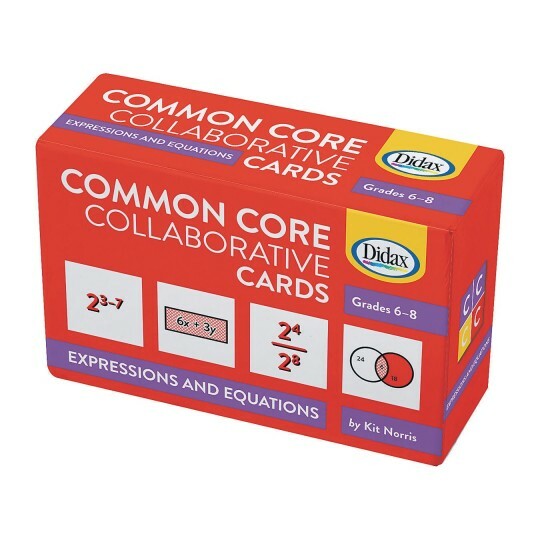 These uniquely designed cards will challenge students with a variety of different types of problems to reinforce CCSS content. They can then be used in collaborative groups, small groups, or individually. Each set contains 120 cards (4” x 6”) 40 cards per grade level that can be assigned on- and off-grade level as necessary. Teacher’s guide provides complete instructions and suggestions for collaborative group problem-solving lessons. inequalities using one variable. In Grade 7, they factor, add, subtract, and expand linear expressions. In Grade 8, the work includes positive and negative exponents, square and cube roots, and more!